Pyelonephritis is an ascending urinary tract infection that has reached the pyelum or pelvis of the kidney. It is a form of nephritis that is also referred to as pyelitis. Pyelonephritis is a potentially serious kidney infection that can spread to the blood, causing severe illness. Fortunately, pyelonephritis is almost always curable with antibiotics. Pyelonephritis presents with fever, accelerated heart rate, painful urination, abdominal pain radiating to the back, nausea, and tenderness at the costovertebral angle on the affected side. 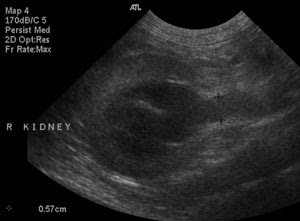 Most cases of pyelonephritis are complications of common bladder infections. Bacteria enter the body from the skin around the urethra. They then travel up the urethra to the bladder. 1. Measure and record the voiding of urine each time. R /: To investigate the change of color, and to determine the input / output. 2. Advise to urinate every 2-3 hours. 4. Help clients use bedpans / urinals. 1. Perform laboratory tests; electrolytes, BUN, creatinine. R /: Monitoring of renal dysfunction. 2. Take action to maintain acidic urine. R /: Acid urine hinder the growth of germs. 3. Increase input berry juice and give medications to increase uric acid. R /: Increased input juice can affect the treatment of urinary tract infections.